I think I just realized this for myself. For those of you don’t know I lost my first husband to cancer when I was 24. I always knew that had an impact on my life but I didn’t quite put it all together as nicely as this sentence. I honestly think it was easier to have blind trust in God when we were fighting cancer than it is right now when everything is “OK.” When everything was completely out of my control I could accept that one. However right now when everything seems fine I feel like I should be able to handle it myself. So why is this so dang hard?? 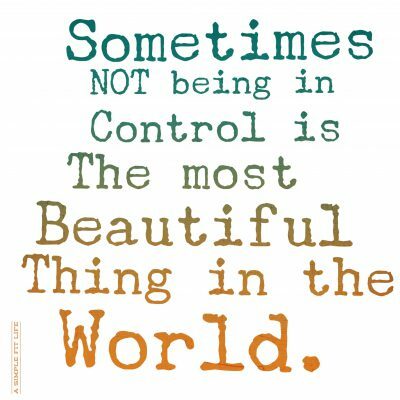 I’m not in control, therefor I should stop worrying so much about being in control. God has equipped me to handle what is happening in my life, weather it’s cancer or toddlers. You know what else? When I fail, when I ‘grip so tight in fear of losing what I love most’ its ok too. I’m human. Either way, if I’ve given up full control to God or am struggling to hold the reigns myself there is grace and for that I am grateful. So for now I’ll keep praying to loosen my grip and just enjoy the blessings I’ve been given.